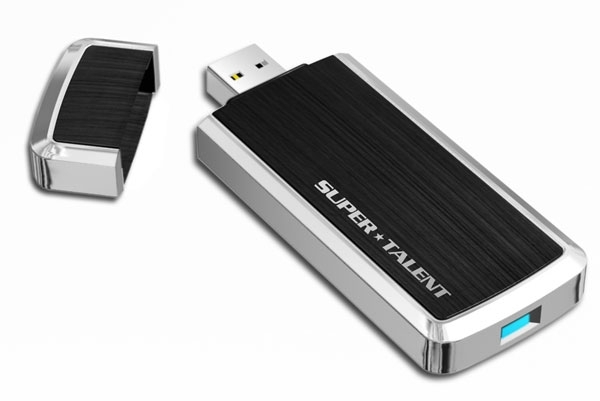 Super Talent Technology today announced their USB 3.0 RAIDDriveTM which is now even faster with over 370 MB/s. When we introduced the USB 3.0 RAIDDrive, we knew that we had reached the limit of the USB 3.0 host controllers currently available. Now that 2nd generation USB 3.0 host controllers are beginning to emerge, this drive is able to show its true performance. Completely unchanged since its debut in January 2010, this drive now posts scores over 370MB/s; a full 55MB/s faster. "This product yet again underscores Super Talent's continued leadership in the USB 3.0 storage market. We now have five USB 3.0 flash drives: from the very fastest, RAIDDriveTM, to the ultra-affordable, Express DUOTM", said Super Talent COO, C.H. Lee. This drive was benchmarked using the new Fresco Logic FL-1009B, the fastest USB 3.0 solution we have tested to date. All our USB 3.0 drives are fully backward compatible with USB 2.0 ports, at USB 2.0 speeds.